via Stimulate the US Economy by Legalizing Industrial Hemp. 2012 Oh boy – the Capitalistic System! Financial advisers are not there to support anyone in finding effective solutions to the problems we all face on a day to day bases in the Money System. They lock you further and further into the Mind into survival patterns, to ensure that you keep being ok with how the Capitalistic System functions and to make peace with your life and your limited choices within the Money System. So let’s take a further look at her article, which to me was a blatant attempt at making sure people don’t really come out of the Money Problems we face as Capitalism, but to make sure you survive and live to ‘spend’ another day. I have underlined the specific words she used in admitting how corrupt the entire system is and also underlined the words she used to manipulation the reader with – words such as hope and motivation – to ensure that people keep justifying and accepting the way things are as our current Capitalistic System. 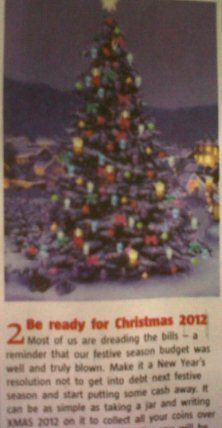 As you can see the article is split into 5 reasons why you should plan your money problems – sorry I meant your “finances” for 2012. “1. 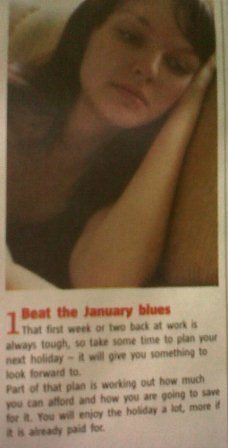 Beat the January Blues. Why have we created this cycle of misery in which we work hard year after year just to pay off our debt to be able to live simplistic lives? Why have we come to accept that we will all be depressed come January because we have to go back into the cycle of slavery to the Elite/Capitalists? Why can we not live in a world where we change the Value of Life so that we live to express not live to survive? What is the enjoyment really for us living in a world where we have to plan how to deal with our debt we make because we want to express ourselves and live? Is this life? Even the ‘advisor’ admits that we are stuck in this pattern of knowing we have to focus the rest of the year on how to raise funds and pay of our debt – which means she knows all are trapped in the same patterns around money – and she even gives you advise how to continue remaining trapped in your cycle within capitalism. “2. Be ready for Christmas 2012.
paid into the savings account. He saved R1900 a year. Other than the fact that all of her advise is old and that you can find this ‘save your pennies advice’ in any woman’s magazine year after year after year, I would also like to add that her husband did not save anything because either way he only has so much money to his name whether he used it that day or months later. Tricky, tricky – how the capitalists lie! My first perspective on point one also ties in with this point – why do we have to juggle debt and worry about our survival? Also – Christmas has never been about Jesus, but about a day in which Capitalists impulses naïve people to buy lots of stuff because they believe in an invisible guy in the sky – so get rid of belief systems that have nothing to do with this physical reality and already people will stop feeling the need to cling to old rituals that are actually only motivated through Capitalism/Consumerism. “3. Bankrupt the debt collectors. only way to get out of debt is to plan your finances. Start a budget and cut back. She is missing the point (or is she?) of Capitalism as all eager Capitalists do. Capitalism is designed to function according to debt. So you cannot on the one hand tell people to cut back on their debt while still supporting a Capitalistic System. If we force the Elite to receive less money from our pockets then they will find new ingenious ways of forcing us to give them money – its call tax increases, general cost increases, the production of expensive products, petrol cost increases, inflation, hidden costs, engineered obsolescence, false advertising and the list goes on. Do not be fooled to think that the Capitalists care – they will find a way to make their money even if it means leaving billions of people to starve every day so that they can control the cost of food and necessities. The entire game of Capitalism first of all plays off people’s fears of survival, therefore obviously Capitalists and ‘financial advisors’ are not interested or motivated to find solutions to debt, poverty and suffering because the entire construct and existence of poverty and suffering creates the polarity friction point necessary to drive the rest of humanity through fear of survival to make/desire more money. 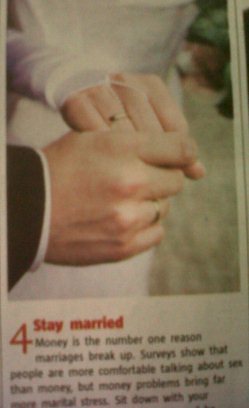 Interesting that she says ‘avoid financial ruin and your marriage will last’ – implying that if people’s relationships and commitment to each other is determined by money then love is not real and the relationship commitment was not real. Also – why should our lives and our expressions be determined by Money? “5. 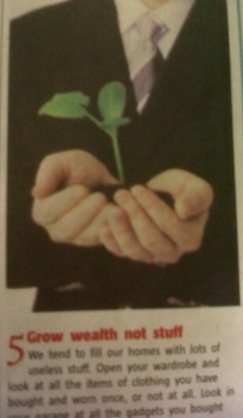 Grow Wealth not stuff. and never use. These items are wealth destroyers. Any person who has studied the basics of how Consumerism functions will know that products are designed firstly according to all the desires, fears, obsession, wants and needs of humans. Human thinking and psychology is studied to understand how we buy and what we buy according to our base programming. Therefore the design of products is specific to target and trigger specific emotions, feelings, fears etc. within people. So – first of all you cannot just suggest to people to look at all the stuff you bought that you never use – without offering them a solution on how to face and defuse the hidden layers that caused you to buy on ‘impulse’. The capitalists will always find ways of impulsing people to buy more stuff – so without understanding the minds connection to what people do, one cannot fully support people to not just buy stuff. Within the DesteniIProcess for example, we work with the hidden layers of the Mind from which one is impulsed or triggered into acting, speaking, thinking, feelings, fearing – without one truly knowing where these reactions/drives came from. A solution: Please read the section of my blog which deals with the FAQ videos and articles on an Equal Money System and see the practical considerations and design behind why I say an Equal Money System will stop survival based living which will allow all the Equal opportunity to Live as a full expression of ourselves here in this physical reality. Woman killed by train in fleeing from police. The SAPS (police) spokesman was quoted as saying that ‘the police cannot be blamed for such an incident. Yes the police and the governments who allow for the existence of poverty and the human race who allow for the existence of rich/poor can never be blamed for anything that happens to the lives of the beings who exist on this planet. The fact that all live is born here Equally from the physical does not matter to the human. We have come to accept and allow that lives are dispensable if and when they interfere with the rich remaining rich and the survival of the middle class. Therefore an incident like this reflects the following – that as the human race we do not care about each other – we care about making money. We do not care about the Abuse and Death in the name of Money as long as it is not a rich person or a person who contributes to the capitalist system that is dying or being abused. The only time we pay attention to the death of someone due to circumstances which are based in greed and protection of the wealthy is when it entertains those who read the newspaper. Therefore those who read the newspaper and only feel curiosity and hopelessness – are actually responsible for the death of the person/plant/animal about who the article is written. Why? Because as long as we allow the Economic/Capitalist system which exists so that we can Live – as it currently is and merely read with a slight feeling of ‘shame; for the being – we are directly observing Abuse for our Survival. This is obviously what the Capitalist system is designed on – the Abuse of Life on this planet so that most can say ‘I survive’. Therefore a blind eye is turned against the reality of what we read in the newspaper. We do not see these events as direct, accountable actions which we are accountable and self-responsible for – we see these events as somewhat sad but really not our fault. The connection has not been made between the event and our participation and acceptance of the world systems. What happens inside you when you read these type of articles? Inside oneself you decide that you will keep your job, no matter what strain it places on you. You will pay your taxes (the fear of going against the big man) and you will abide by all the rules given to you by your government. That way you will remain safe and keep yourself and your family from being chased, abused, murdered, raped, sold or killed. The actual fear that is driving people is impulsed from the media –that is why the real story of why that woman died will never be told. The media, governments, criminologists etc will never use their clever advisors, cabinet members or researchers to actually dissect the world problems and see the causes for the problems, find direct sustainable solutions, find management teams to implement them and stop the madness. Therefore it will be you and I who see the problem and recognise the solution who will write about what we realize, place it for all to see and stand together as one voice. Through this we create waves of awareness which will eventually allow all to see and realize– that the way we live now and what we accept is not cool. If your child grows up to be that woman living on the street, running for her life just to be hit by a train rather than have to be caught by the police – would you shrug the event off? How many of your children would have to become that woman, to die tragically for you to pay attention and not just read the newspaper article for the sake of amusement? If your answer is – ‘well it won’t happen to my child – I protect my children’. Then ask yourself the question – who will become that woman in the current capitalist system – oppressed through the system of labour and profit – so that your children are protected one day as adults in the system? I suggest always place yourself and your children in the shoes of those who pay the price so that the rest of humanity can chase our desires. My blogs will expose world events as they really happened. 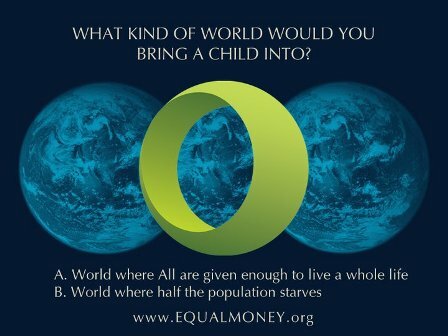 The cause, the consequences, the actuality of how our existing Money System directly and indirectly creates the abuse and suffering of millions – which is why as solution I suggest the implementation of an Equal Money System.